Air to air, C-47 dropping propaganda leaflets over enemy terrian. LS, 8th PSYCOPS Hqs bldg. (Quonset hut). CU South Vietnamese waman illustrator at work. VS, South Vietnamese soldiers, men, women and American soldier seated at desks working on propaganda leaflets. LS, 2 l/2 ton truck backs up to C-47. VS, three American soldiers pass cartons of leaflets in chain fashion from truck to plane VS, trucks pull away. Int; C-47 in flight. Soldiers drop leaflets through chute. CU, leaflets dropping through chute. Air to air, OV-2 dropping leaflets AV, countryside seen through chute. Leaflets coming out of plane and dispersing. Tnt navigator checking map. CU, sign: "CO "AV' 8TH PSYOP BN - PRlNTING." CU, South Vietnamese soldier enters print shop. 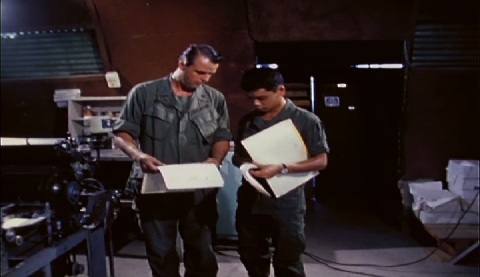 Int; Viet soldier gives material to be printed to American soldier Int, two American soldiers look at material to be printed. Ints, soldier makes negatives far leaflet layout. VS, soldier makes printing plate from negative. VS, soldier inks plate and puts it in printing machine. CU, machine printing leaflets. CU, soldier uses cutting machine to trim leaflets. VS, soldier fills cartons with leaflets. NOTE:(CORDS) Civil Operations and Rural Development Support. Chicago: “Vietnam: A Television History; CORDS, A New Concept of War (PSYOPS),” 04/29/1970, WGBH Media Library & Archives, accessed April 24, 2019, http://openvault.wgbh.org/catalog/V_C8669E838F75406EA124BC10CB8A429B. MLA: “Vietnam: A Television History; CORDS, A New Concept of War (PSYOPS).” 04/29/1970. WGBH Media Library & Archives. Web. April 24, 2019. <http://openvault.wgbh.org/catalog/V_C8669E838F75406EA124BC10CB8A429B>.